of the wild Northwest, Quaker Puffed Wheat . 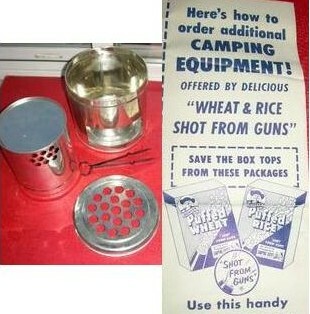 . .
the breakfast cereal shot from guns . . .
Two gun shots ring out.
. . . present the Challenge of the Yukon. In his relentless pursuit of lawbreakers. Gold - gold - discovered in the Yukon! A stampede to the Klondike in the wild race for riches! The Challenge of the Yukon. SERGEANT PRESTON'S TALE OF TAMMING THE VAST NORTHWEST CANADIAN TERRITORIES BEGAIN AS A FIFTEEN MINUTE SERIAL entitled Challenge of the Yukon. It aired in Detroit from 1938 until May, 1947. 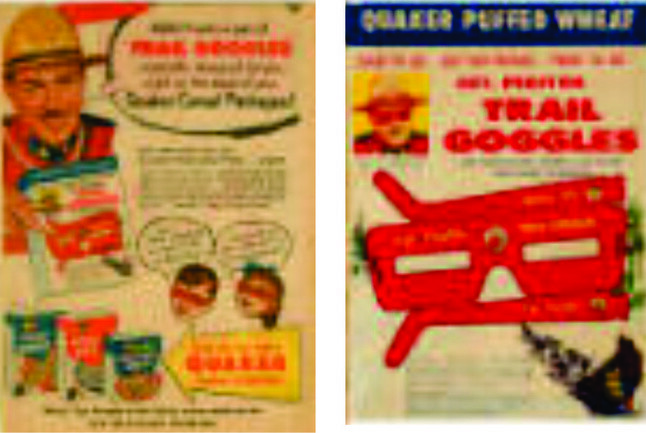 Shortly thereafter, the program acquired the sponsorship of Quaker Oats, and the series moved to the networks in a half-hour format. ABC broadcast the show for approximately two years, and then it moved to The Mutual Broadcasting System until its final broadcast on June 9, 1955. 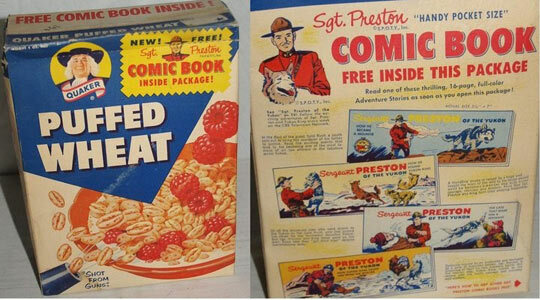 The title changed from Challenge of the Yukon to Sergeant Preston of the Yukon in November, 1951 and remained under that name through the end of the radio series and into television. The popular show showcased Sergeant William Preston of the North-West Mounted Police and his lead sled dog, arguably the true star of the show, Yukon King. Together they fought against lawlessness and evil in the northern wilderness during the Gold Rush of the 1890s. "The Two Bullets," which was broadcast on April 5, 1950. Unfortunately, it does NOT contain the memorable intro--but, I'm still looking for one that does. Typical plots involved the pair helping injured trappers, tracking down smugglers, or saving cabin dwellers from wild animals. Sergeant Preston's faithful steed was Rex, used primarily in the summer months; but generally, Yukon King and his dog team were the key mode of transportation as evidenced by Preston's memorable cry, "On, King! On, you huskies!." From the mid-forties right up to 1954, actor Paul Sutton played Sergeant Preston, with Brace Beemer of The Lone Ranger fame briefly taking the role in the mid-fifties. King's barks, whines, and howls were usually provided by animal imitators and sound effects artist Dewey Cole. After Cole's death, actor Ted Johnstone voiced the clever lead dog. 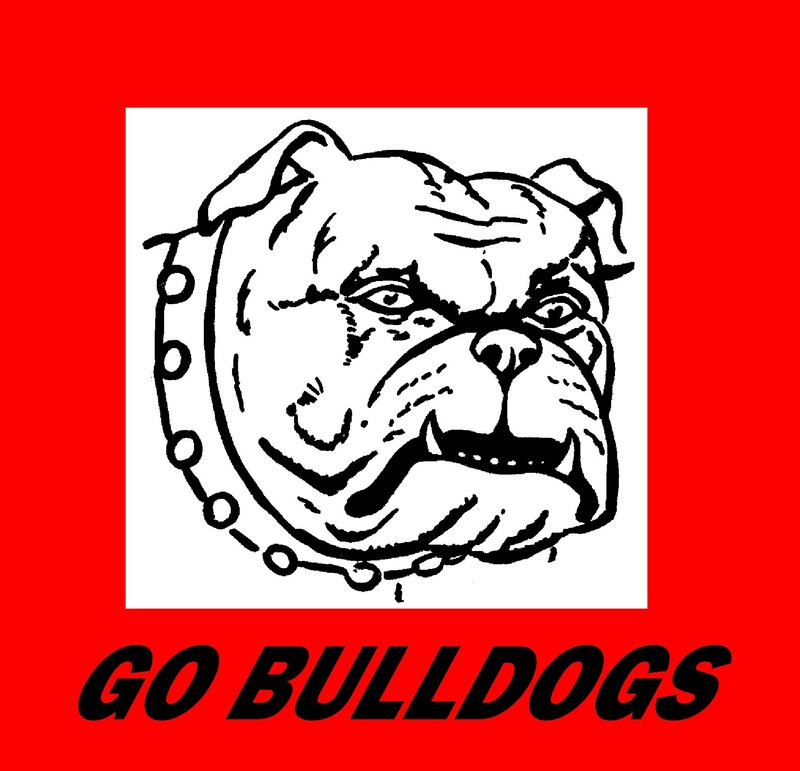 There is some confusion regarding King's actual breed. The writers seemed to use malamute and husky interchangeably. At least once during an episode, Preston answered malamute to the question from another character; and in the early radio shows, the cry of, "On, you huskies!" would alternate with "On, you malamutes!" from show to show. 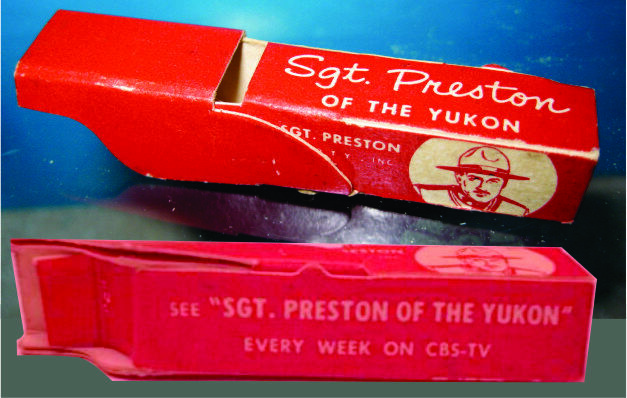 In 1955, the same year the radio show ended, Sergeant Preston of the Yukon premiered as a television series. Richard Simmons starred in the lead role and was supported by Yukon King and Rex, now played by real animals. The dog cast as King was not a husky, however but was a large Alaskan Malamute. This is the Yukon, the territory patrolled by Sgt. Preston, where man and nature combine pitilessly to defeat the weak and the artless. Nothing is stranger . . . or stronger . . . than the lust men have for gold,” Quaker cooed in its promotion. In the Gold Rush, men fought the wildest country on earth and the most savage of climates to get to the Klondike where your land is. During the winter, the only way to the gold fields was by ‘mushing’ for week after week. The more fortunate were aided by dog teams pulling sleds. No one knows how many brave men died along the frozen Yukon River that runs past your land. The wilderness teemed with grizzly bears, wolves, moose, caribou, and other wildlife. In the winter, temperatures fell to 70 degrees below zero. Your land gets colder than it ever gets even at the North Pole,” Quaker Oats warned. If you were on your property in temperatures like this, it would be dangerous to take deep breaths! 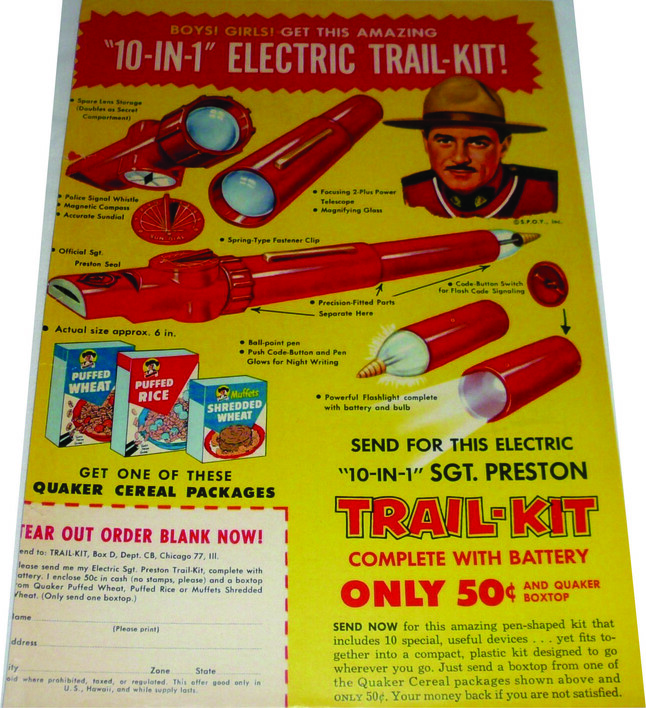 It all began in 1955 when the Quaker Oats Cereal Company in Chicago, Illinois was looking for a promotional gimmick to help their popular radio program, Sgt. Preston of the Yukon, make the transition to television. 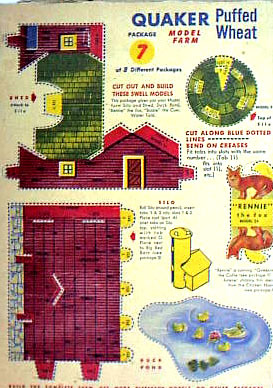 Chicago advertising executive Bruce Baker, the creative director for Wherry, Baker & Tilden, hatched the following plan: “Quaker Oats would buy a parcel of land in Sgt. Preston’s Yukon Territory; subdivide it into square-inch lots; and give the lots away to buyers of Puffed Wheat, Puffed Rice, and other Quaker cereals. 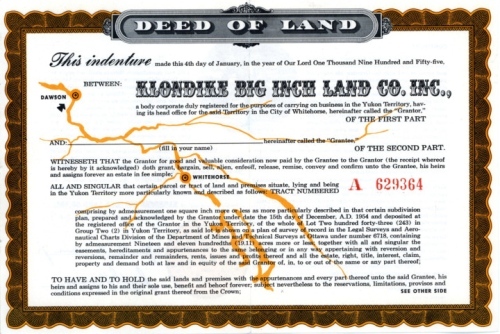 It would be a totally legal transfer of land: every kid who dug to the bottom of his or her cereal box would find a deed to one square inch of Yukon property. “Lawyers would draw up the deeds. They’d be gold-embossed, and have loads of legalistic fine print on them, and a corporate seal, and a place to put the new owner’s name. “The kids would actually own a genuine piece of Canadian Gold Rush land, Sgt. Preston land, Yukon King land. They’d go crazy trying to get them! 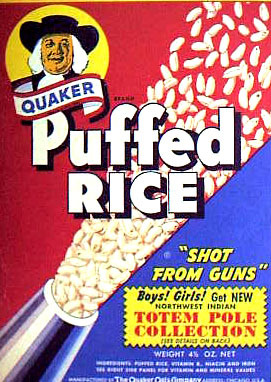 The problem was Quaker Oats hated the idea. It was impossible, the company’s lawyers told Baker. Registering the deeds to millions of tiny tots, even if it could be done, would cost the company a fortune. “Then we won’t register them,” said Baker. “Forget it,” said the lawyers. But he wouldn’t forget it. In early October, 1954, Baker, his brother John (a lawyer), and a Quaker Oats advertising executive chartered a plane and flew to the Yukon to look for land. “Their guide for the trip up river was Constable Paul LeCocq, a real live Mountie from Montreal who was stationed in Dawson. LeCocq, Baker remembers, actually had a team of huskies led by a lead dog named Yukon King; and he received all the fan mail addressed to Sgt. Preston of the Yukon. We arose at about 5:15 am., and after getting dressed found it was still dark. It was several degrees below zero. Finally Paul appeared in his pickup truck. We bundled up as well as we could and went down to the river. It’s a forbidding sight with ice cakes zooming by at about six miles per hour. 'We didn’t have enough weight in the bow and the wake sprayed up over Paul and froze as it hit him; his leather jacket was soon completely covered with ice. Paul told us a human being couldn’t last more than three minutes in the water. We maneuvered upstream against the swift current for about forty minutes and came to a point opposite the land in question. 'Paul turned in toward shore and suddenly -- Crash! We smashed up on a rock. About fifteen gallons of water came in over the stern and immediately turned to ice in the bottom of the boat. We then paddled in about fifty yards, went ashore, and examined the motor. The shear pin had broken and we had no spare. “They made a hurried inspection of the Quaker Oats property, which they described as ‘fairly level with a beach of stones about 100 feet wide; quite thick with jack pine and spruce, poplar and birch.’ Then they headed back, drifting with the current, wet and cold, to Dawson. “ ‘I remember there were all these old guys, real Gabby Hayes types, living in cabins along the river,’ laughs Baker. ‘They must have wondered what was going on as we floated on by dressed in Brooks Brothers’ suits and Chesterfield coats. We had no hats and were just wearing shoes, no boots. 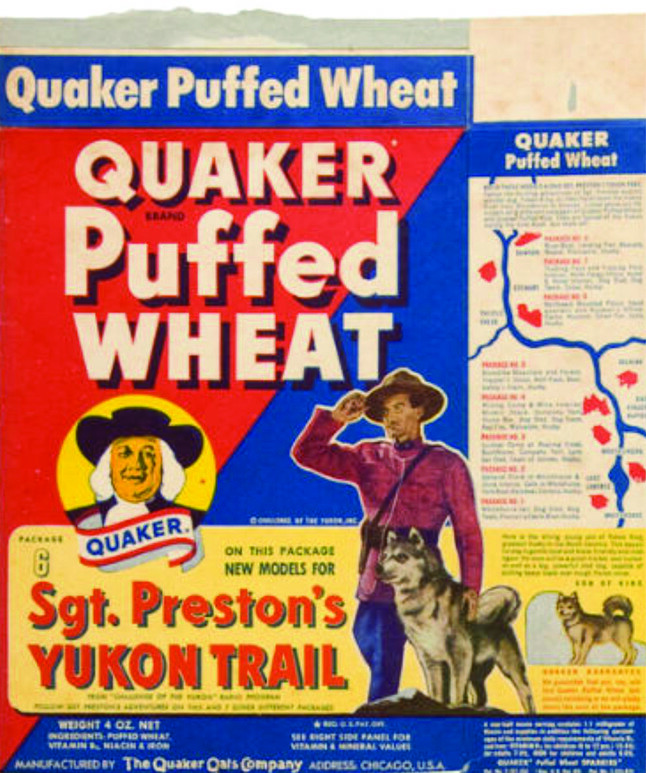 Quaker Oats formed a subsidiary, the Klondike Big Inch Land Co., incorporated in Illinois, to handle the promotion. Baker’s deeds could now be decorated with an official-looking corporate seal. The promotion was first announced on the Sgt. Preston network radio show on Jan. 27, 1955. 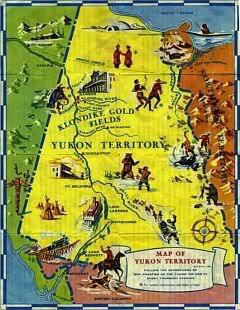 At the same time, advertisements, “You’ll actually own one square inch of Yukon land in the famous gold country!” appeared in ninety-three newspapers. The public response outdistanced Baker’s wildest dreams. 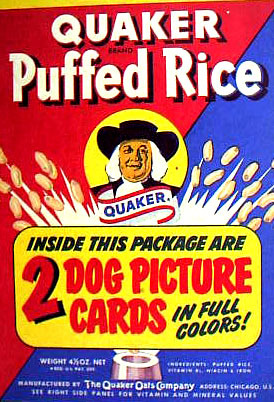 Quaker Oats cereal sold as quickly as the deeds could be printed and stuffed into the boxes. Grocers even set up special Quaker Oats displays. Quaker distributed over twenty-one million deeds. The yellow-framed, individually numbered certificates carried a corporate seal, a logo of a prospector panning for gold and a place for the owner to sign his, or her, name. The deeds excluded mineral rights although the area had by then already been stripped of gold. They wanted to be sure that deed owners wouldn’t try to mine their square-inch properties. It was also stipulated that owners had to allow perpetual access, or “easements,” across their land to others who might wish to visit their own inches. Quaker Oats still receives hundreds of inquiries every year from kids who have grown up and rediscovered a deed and from executors of estates who have come across a Big Inch deed in a deceased’s belongings. How much, they all want to know, is this land worth now? Is the deed genuine? Are there taxes owed on the land? Where exactly is it located? But, alas, the replies carry sad news. Not only do these people not own the land now, they never did because each individual deed was never formally registered. The Klondike Big Inch Land Co., an Illinois subsidiary established to handle the cereal’s land affairs, has gone out of business. And anyway, the Canadian government repossessed all the land back in 1965 for nonpayment of $37.20 in property taxes. Quaker has been threatened with lawsuits over the matter and is tired of the time and expense required to answer letters. Quaker executives cringe at the mention of the promotion. It’s unlikely, however, that a lawsuit would proceed very far. Since the Klondike Big Inch Land Co. has been dissolved, there’s nobody left to sue. In effect, it would be like suing a dead person who has left no assets. That’s the bad news. 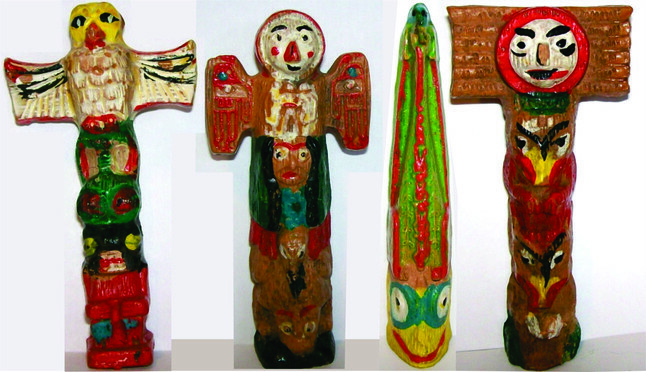 The good news is that, thanks to the nostalgia boom, a number of memorabilia experts claim the old deeds are now worth as much as $90 each to collectors. Following up the land give-a-way, cereal eaters were offered a one-ounce “poke” pouch of genuine Yukon dirt for 25 cents. This promotion, too, was a success. To Canadian lawyer Van Roggen, it was fun. “I called a fellow I knew in Dawson and told him to sift four tons of sand from the bed of the Klondike River. It had to be pebble-free, and I wanted him to store it in a warm warehouse. I couldn’t tell him, though, what we wanted it for. The people up there thought he’d gone out of his mind." The sand was trucked to Whitehorse, packed into pouches, then sent overland to Anchorage, Alaska. It had to be mailed from there because of postal difficulties in sending it from Canada. 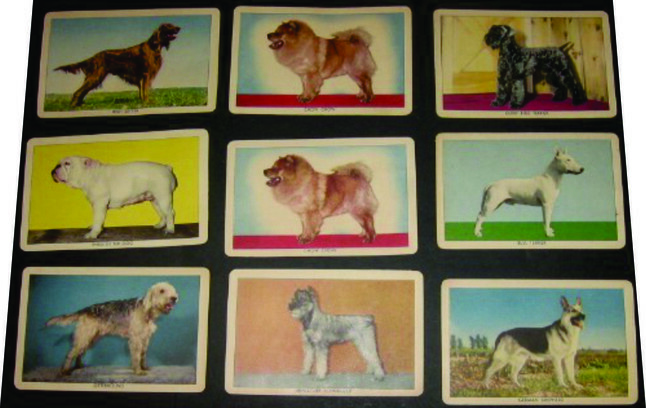 Each package of Quaker Puffed Rice and Quaker Puffed Wheat contained pictures and information on two breeds of dogs. The entire collection totaled totaled cards. 4. 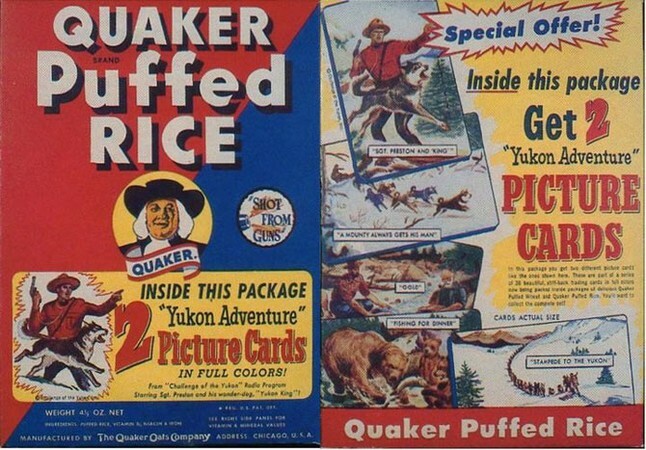 Yukon Adventure Story Cards, (1950), Quaker Oats Two action-packed, colorful pictures of life on the Yukon were found in each box of Puffed Rice and Wheat for a total of 36 cards. 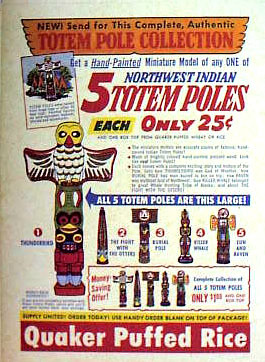 They were issued first in 1950 to promote the radio series and reprinted in 1956 as an adjunct to the television series. 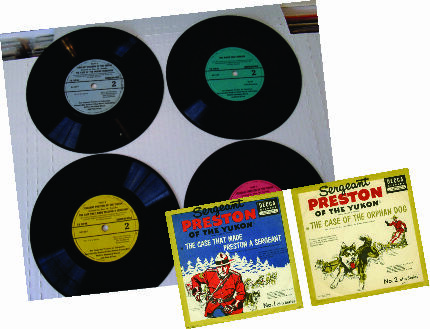 These are included because they came at the very beginning of the television series but, no doubt, were eagerly welcomed by Preston radio fans. 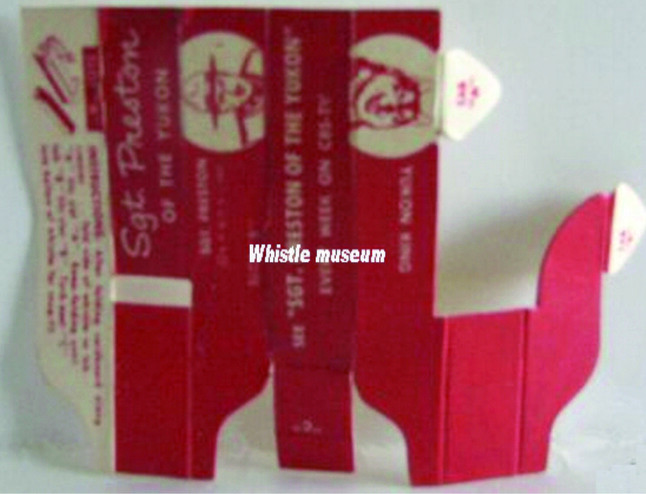 The whistle was originally printed on a flat 3.5" x 4.5" waxed cardboard sheet. The small comic books were entitled: "How He Became a Sergeant," "How He Found Yukon King," and "How Yukon King Saved Him from the Wolves." 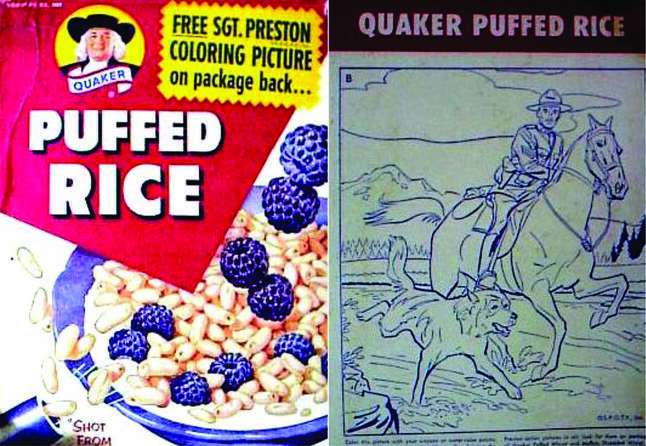 Three Great Adventure Games, complete with game board, rules, and playing pieces, were featured on Quaker Puffed Wheat and Rice. 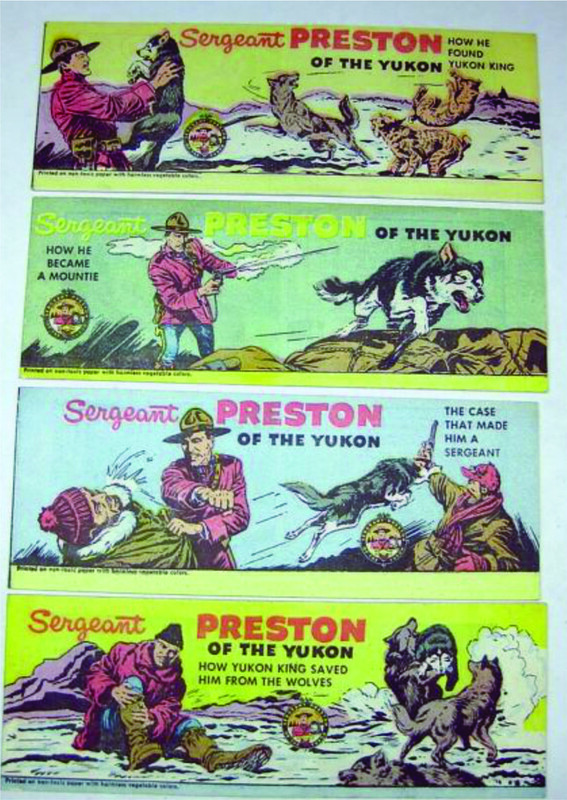 Their titles were: "The Great Yukon River Race," "Sergeant Preston Gets His Man!" and "The Dog Sled Race." 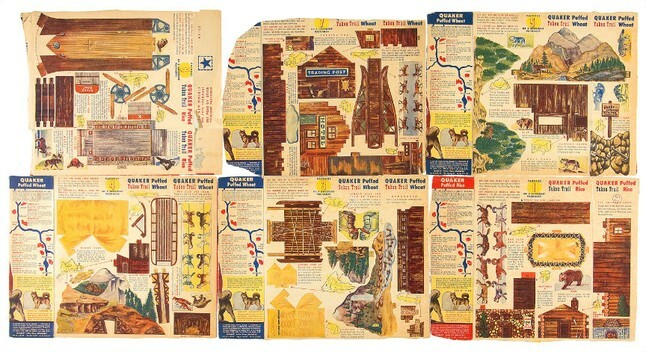 Fifty-nine models of buildings and animals that were found along the Yukon Trail were featured on eight separate cereal packages. Cut and assembled, they gave the owner a real presence in the Yukon. A Stagecoach, Chuck Wagon, Buckboard, Great Plains Freighter, and a Covered Wagon were avaiable. Each was only 25c plus a boxtop, or all five wagons could be had for only $1 and a single boxtop. They were easy to assemble and were big, at least 4 1/2" long or more. And get this, they came with a money back guarantee! 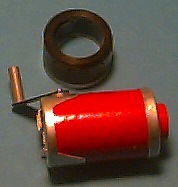 The metal dectector is made from hard plastic operated by battery. 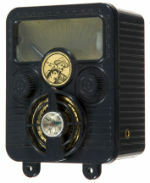 "Zany Toys Ore Detector" is marked on the dials. The top center has a foil sticker with portrait of Sgt. Preston and Yukon King and an additional sticker around the working compass has the letters of the alphabet. 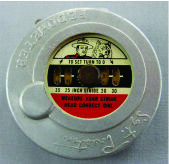 Gauge appears at top beneath a clear plastic window. A battery is supposed to move gauge needle when unit is near metal. "Challenge of the Yukon/Maple leaf Forever"
"How He Became a Sergeant"
"Case of the Orphan Dog"
"Case of the Indian Rebellion"